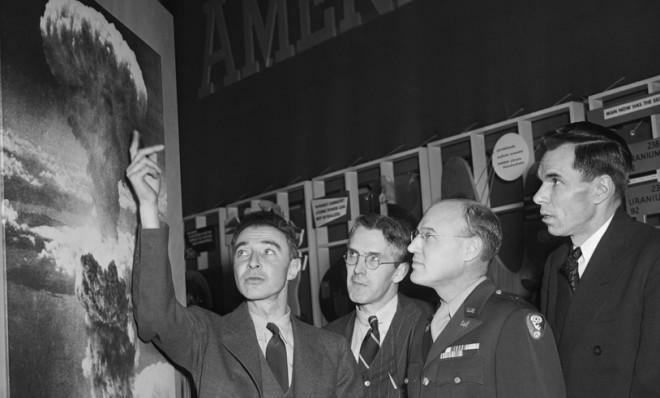 R.J. Oppehnheimer (left), one of the creators of the atomic bomb, went for the overly dramatic. 1. Laurence Oats before walking into a deadly blizzard: "I am just going outside and may be some time." In 1911, Captain Laurence Oats joined the expedition of Robert Falcon Scott to the South Pole, which they reached only to find that another explorer had beat them to it, 34 days earlier. 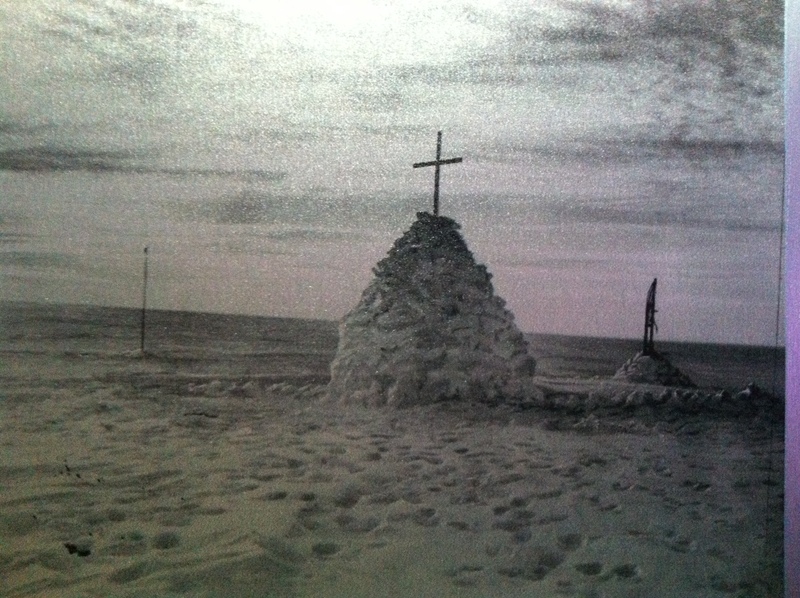 On the trek back to base, the weather was unforgiving, falling to -47 degrees Fahrenheit. One member of the party froze to death. Then Captain Oats' feet became severely frostbitten, reducing the pace of the survivors to a lethal slowness. He demanded to be left behind so the remaining three men could have a chance of reaching the next food depot. His comrades refused. On March 17, during a blizzard, Scott recorded in his journal that Oats left the tent, saying he was, "just going outside and may be some time." He was never seen again. His brave sacrifice, sadly, did not save the lives of his friends, who died in a blizzard 12 days later, only 11 miles from their goal. Their bodies were recovered; Oates' never was. A cairn was erected with the words, "Hereabouts died a very gallant gentleman, Captain L. E. G. Oates, of the Inniskilling Dragoons. In March 1912, returning from the Pole, he walked willingly to his death in a blizzard, to try and save his comrades, beset by hardships." 2. Daniel Daly before charging into battle: "For Christ's sake men — come on! Do you want to live forever?" If you saw Daniel Daly's small frame behind a desk at the bank where he worked later in life, you would never have imagined you were looking at one of the most ferocious Marines the American armed forces ever produced. By the time Sergeant Daly was deployed to France in WWI, he had already been awarded the Congressional Medal of Honor twice. The first time was for single-handedly defending the American Embassy in China against a 500-strong mob during the Boxer Rebellion, and the second for retrieving a heavy machine gun from the bottom of a river while under siege from Haitian rebels (and then dispatching said rebels). By 1917, Daly was leading a troop of Marines who were besieged by Germans in the Battle of Belleau Wood. They were outnumbered two to one and trapped in their trench by an endless storm of German machine-gun fire. There was only one way to break the German's advantage: charge the enemy. Daly jumped from the trench and shouted to his men, "For Christ's sake men — come on! Do you want to live forever?" He led his men over the top directly into enemy fire. On June 26, 1917, the U.S. High Command received the following telegram: "Woods now U.S. Marine Corps entirely." Daly died in 1937 with full military honors, not living to see the 1942 Destroyer, the USS Daly (DD-519), commissioned in his name. 3. Sergeant Milunka Savic on preparing to stand at attention till a next-day verdict: "I will wait." In 1912, when Milunka Savic was 24, her brother was called up to serve in the first Balkan War. We're not sure if Milunka took his place or just went along, but we do know that she assumed a male identity and became a highly decorated soldier in the Serbian army. She apparently kept her gender a secret through the First Balkan War and into the Second, when a Bulgarian grenade wounded her so severely that her gender was revealed to the field surgeons. Savic was called before her commanding officer. They didn't want to punish her, because she had proven a valuable and highly competent soldier. The military deployment that had resulted in her gender being revealed had been her tenth. But neither was it suitable for a young woman to be in combat. She was offered a transfer to the Nursing division. Savic stood at attention and insisted she only wanted to fight for her country as a combatant. The officer said he'd think it over and give her his answer the next day. Still standing at attention, Savic responded, "I will wait." 4. J.R. Oppenheimer on his Manhattan Project: "Now I am become death, the destroyer of worlds." This sentence reads like dialogue spoken by an alien warlord in a science-fiction movie. So it all the more unsettling that Julius Robert Oppenheimer was neither exaggerating nor boasting when he said it. His studies in physics added to human knowledge about the most unfathomable questions in the universe; black holes, nuclear physics, spectroscopy, quantum field theory, and quantum electrodynamics. But his work wasn't just theoretical. His knowledge of nuclear theory was put to a devastatingly practical use in WWII, when he became the lead physicist on the Manhattan Project, which developed the first atom bomb. Years later, in 1960, Oppenheimer would recount how he felt watching the first detonation. "I remembered the line from the Hindu scripture, the Bhagavad Gita…..'Now I am become death, the destroyer of worlds.'" Watch Oppenheimer speak the words here. 5. The Spartans on calling an enemy's bluff: "If." Philip II of Macedon was the father of Alexander the Great. His son would one day conquer the (known) world, but Philip got things started by conquering all the city states of ancient Greece. Well, almost all. Sparta, on the southernmost tip of the land Philip sought to control, was a strict military culture known for its brutal martial prowess. In 346 B.C, Philip sent a message to intimidate the Spartans. "You are advised to submit without further delay, for if I bring my army on your land, I will destroy your farms, slay your people and raze your city." The term "Laconic wit," comes from the Spartan region Laconia. The Spartan employed it to great effect with their one word response to Philip: "If." Philip never attempted to conquer Sparta. 6. Andrew Jackson: "John Calhoun, if you secede from my nation I will secede your head from the rest of your body." Andrew Jackson is reported to have said the above to Calhoun, his own vice pesident, in regards to Calhoun's supporting the idea that South Carolina should consider secession from the United States. While finding any verifiable source is difficult, the quote is not only awesome, but likely. President Andrew Jackson was extremely fierce and probably a little bit crazy. He enlisted in the Continental Army at age 12. He then became a prisoner of war to the British, and, when told to shine a British general's boots, he mouthed off so badly that the officer slashed his face and hands, leaving scars for the rest of his life. But the bloodshed didn't end there. The future president fought in many of the battles and wars that occurred as America was settled. He participated in 103 duels, mostly to defend the honor of his wife. At the age of 67, he brutally beat a man who tried to assassinate him and then erected a statue of himself at the scene of the incident. Threatening to decapitate the vice president he didn't like anyway would have suited his character quite well.